NACUBO’s 2018 Distinguished Business Officer Award recipient Morgan R. Olsen credits his success to a constant willingness to improve his skill set. After serving at five institutions, both private and public, large and small, all over the country, Morgan R. Olsen has spent the last decade at Arizona State University (ASU), Tempe. As the executive vice president, treasurer, and CFO, he has a broad array of responsibilities, overseeing departments ranging from the campus police department to facilities development and management, human resources, information technology, and environmental health and safety. 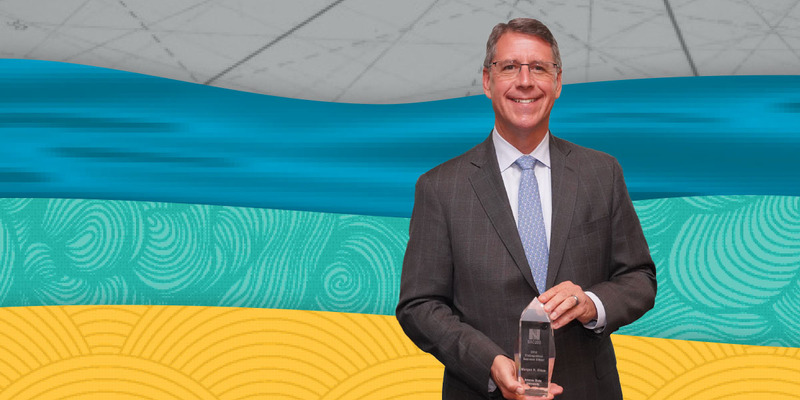 Business Officer recently interviewed Olsen, who received NACUBO’s 2018 Distinguished Business Officer Award, to find out more about his 33-year career in higher education. You joined ASU in 2008, just before it underwent a $196 million investment reduction from the state. Did you know what you were getting into at the time? No, I did not realize the country was going into a major recession, but I don’t think it would have made a difference in my decision. What specific steps did you take to keep the institution on track during the recession? When we were notified in January 2009 about our first significant reduction, we were seven months into our fiscal year and had already made major resource commitments to our people and partners, so we had to be creative. I vividly remember that most of the employees of the university—faculty and staff—took what was essentially a reduction in pay or a furlough. They didn’t have to work, but because they were committed to the student experience and the mission of the university, almost everyone who legally could work, continued to work during that period. Initially, we took tactical steps to live within the limited resources available. Like other organizations, we temporarily reduced travel and capital investment, including equipment. But we realized that we really needed to think long term about what we wanted the university to be and how we wanted it to serve students, citizens, and other stakeholders. We made the commitment not to eliminate any tenured or tenure-track faculty during the Great Recession because they are directly responsible for the student experience and student success. Ultimately, we realized that we needed to change the business model of the university. Now, roughly 10 years later, the level of the state’s investment in higher education and our institution hasn’t changed appreciably, but our business model has. How did you change the business model at ASU? To generate revenue, we increased the sticker price of tuition substantially, as well as increased institutionally funded student aid to an even greater extent. We also expanded and diversified our student body. For example, we now host a larger proportion of international students and domestic students from other states. We also grew our ASU online operation from about 1,750 students in 2008 to more than 35,000 today. In addition, we leveraged technology everywhere it made sense, raised more money from private gifts, and established partnerships in sponsored research and in support areas. For instance, our partnerships in student housing have added close to 8,000 beds in state-of-the-art living and learning communities that are capitalized and constructed to our specifications. We optimized the “one university in many places” model, meaning that we have multiple physical locations (four campuses), but we maintain a single administrative structure with one president, one chief business officer, one chief academic officer, and one set of deans and other administrators. This has allowed us to be highly cost effective. You have a particular interest in campus design and architectural concepts. Explain your work in that area. As a CFO, we have input in our resources and how they are invested. We have both the responsibility and a good portion of the authority to help determine the physical environment of the campus. A new building is an important opportunity to meet the needs of the university for 60 or more years. We’re creating a physical environment for many people to use and enjoy. Whether you do it well, or do it poorly, a new building will be there for decades. It’s a responsibility that I take seriously; although, I admit that I probably drive people crazy because I tend to be a bit of a perfectionist about how things look and are maintained. Name three factors that have contributed to your success. The single most important factor for success is concentrating on talent acquisition and retention. People are a university’s greatest asset. I’m fortunate to have a team of smart, hardworking people who are technically competent, because I believe that we are only as good as our teams. The second factor is the willingness to put in the hard work and the time. CFOs have a broad portfolio that can’t be done Monday through Friday between 8 a.m. and 5 p.m.
How do the challenges of small institutions compare to giants, such as Arizona State University? I’ve learned that the difficulty of problems is not proportional to size. Our operating budget here is about $3.2 billion but that doesn’t mean that our problems are any more challenging than an institution with a $32 million budget. When you have a controversial issue to address with your board of trustees, how do you present it? Board members have a lot of responsibility, so they are looking for a trusted adviser who can answer their questions in an understandable way. As CFOs, we need to figure out a way to communicate effectively so that the people entrusted with policy decisions have the information that they need. A corporate executive on the finance committee of one of the boards that I served once told me, “Simple is hard, and hard is simple.” What that means is that it’s easy to make things look complicated, but it’s a true gift to take a complicated topic and explain it so that people can understand it and make good decisions. What challenge should institutions be preparing for in the next decade? We have to effectively answer the question about the value proposition of higher education. We have to make sure that we are managing our institutions cost effectively, and continuously communicating to people what we are doing, how we are doing it, and why we are doing it. We have to show that an investment in higher education is worth more than the cost. How can other business officers achieve your level of success? What steps should they take to succeed in their careers? We all have to find our own way, but what I have tried to do in a plodding, methodical way is determine the skill sets that I needed to succeed. I tried to seek out and learn from those who were exemplars and soak up everything that they knew about their organizations and life. Best book: The Prince by Niccolo Machiavelli. Best vacation: My family and I went to Norway, Finland, and Russia with longtime friends the summer before last. Best memory of childhood: Summers in North Dakota, where I could spend all day outside playing games with friends, go home at the end of the day exhausted, eat dinner, go to bed, and then get up and do it again. Best pet: I’ve had a lot of pets and I loved them all. My current pets are Dante, a Goldendoodle, and Ozzy, a desert tortoise. Best pastime: Playing ice hockey. Yes, I still play even though I’m not as fast as I used to be. Best teacher/mentor: I’ve had great teachers, but I learned more from Neil Souther, my Latin teacher throughout my four years of high school, than anyone else. Best lesson learned: Be kind. Best app: Probably Google because it lets us have almost any type of information at our fingertips instantaneously.